The reason why we have seen crazy developments such as full Windows 10 on ARM on Lumia 950 handsets was due to the amazing work of Rene (aka Heathcliff74 ) who created the Windows 10 Mobile unlock solution that finally broke Microsoft’s bootloader protections. Now Rene has posted Windows Phone Internals 2.5, which includes a number of significant fixes which should mean even more handsets are accessible to developers. New command line functions for backing up and restoring the partition-table of the phone: BackupGPT and RestoreGPT. The backup-file is an XML-file containing all the information about the partitions. If you want you can edit this file and then restore it back to the phone. Obviously, this is very risky and you should do this with caution and at your own risk! The archive of a Custom ROM can contain a file named “Partitions.xml”. When this file is present, it is parsed and merged with the existing partition-table on the phone. You can get an example of such XML-file by using the command line to create a backup of the partition table of the phone. The Partitions.xml file inside the archive does not need to be complete. Only new partitions and modified partitions need to be present inside the XML-file. For modified partitions, you only need the name and the modified properties. Other elements can be omitted. The information in the XML-file will be merged into the existing partition table. This behavior can be tested using the command line - function MergeGPT. Support for Windows Mobile 10.0.15254.490 and 10.0.15254.527, for both SecureBoot, unlock and Root Access. 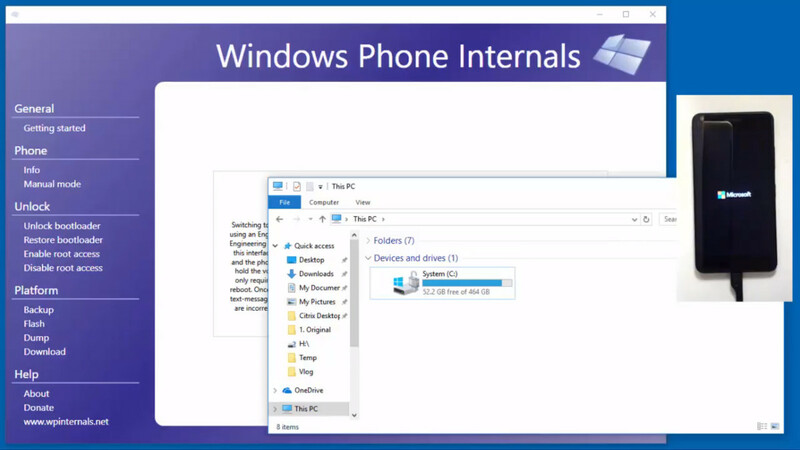 On a small number of Lumia phones, Windows Phone Internals was not able to find a Flashing Profile. The parameters which were checked have been extended in this version. This problem should be fixed now for most phones. Windows Phone Internals 2.4 could crash when launched on Windows 7. This is fixed. In Windows Phone Internals 2.4 there was a fix for detecting misbehaving Mass Storage drivers. This detection doesn’t work properly on Windows 7. When Windows Phone Internals is launched on Windows 7 the detection for misbehaving Mass Storage drivers is disabled. So Windows Phone Internals doesn’t crash anymore on Windows 7, but for the most stable unlocking behavior you should launch Windows Phone Internals on Windows 8.1 or on Windows 10. When a corrupt FFU-file was used for unlocking, Windows Phone Internals could crash. FFU-files can get corrupted when the download is aborted. Windows Phone Internals will now verify the headers and the length of the FFU-file before the unlock-process starts. Under some circumstances, a phone could get stuck in Flash-mode after a stock FFU was flashed. This behavior is detected and in this case, the phone is first relocked before the stock FFU is flashed to fix this problem. Relocking a phone that was not unlocked, could leave the phone in flash mode. When a phone in Mass Storage mode has had a drive letter assigned to partitions other than MainOS, the next time these drive-letters are also assigned. When a phone is unlocked, the extra drive-letters could confuse the unlock-process. Unlocking now checks the partition-names for correct behavior. When unlocking a phone with Bootloader Spec A, which was already updated with new firmware, Windows Phone Internals could crash due to unexpected changes in the partition-layout. This is now detected and handled properly. Some driver versions for Qualcomm Emergency Download mode failed to report a correct Bus Name. Because of this Windows Phone Internals was not able to detect the phone properly when it was switching to Emergency Download Mode. This could make Windows Phone Internals hang while trying to switch to Emergency Download mode when the phone was being unlocked. When the Bus Name in the driver is missing, Windows Phone Internals will make some assumptions to unlock the phone successfully. On some engineering Lumia’s the function to switch to Mass Storage Mode did not work properly. When there is no Profile FFU available, the button to restore the bootloader was disabled without a warning. Under these circumstances, this new version will display a proper warning. Read more about the app at WPInternals.net here and find the app at his site here.